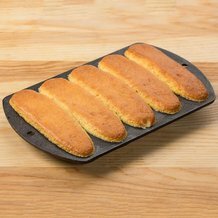 Our Lodge Cast Iron Corn Stick Pans is OUT OF STOCK, but we have ordered more! You are still able to purchase it now and we will ship it to you as soon as it arrives. Questions? Please call 1-800-438-5346 or email us at info@Lehmans.com. Durable cast iron pans give you even heating for making scrumptious, golden brown corn muffins. 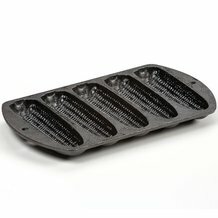 Each pan makes 5 corn sticks shaped like ears of corn (5"L). Pan used: Cast iron corn stick pan. Preheat oven to 400F. Grease a cast iron stick pan and put in oven to heat while making batter. Beat egg, sugar and shortening together in a bowl with a wooden spoon. Mix flour, cornmeal, salt, baking powder, baking soda together and add to other mixture alternately with buttermilk. Pour batter into hot pan. Bake at 400F for 20 minutes. Makes up to 12 corn sticks. Serve warm with butter and can be served with chili con carne. I bought these as a Christmas gift for a friend that has wanted some for years. It took some looking as they had to met my rigid specification. They had to be made in America, had to be top quality and at a sensible price. Lehman's came though again !